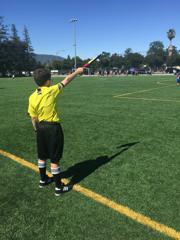 Interested to referee for DeAnza Youth Soccer League? Fill in all the info. Use YOUR EMAIL ADDRESS, not a parent address, (but you must read that email at least once a day). You will need a Social Security number (SSN). If you don't have one, you need to GET ONE.